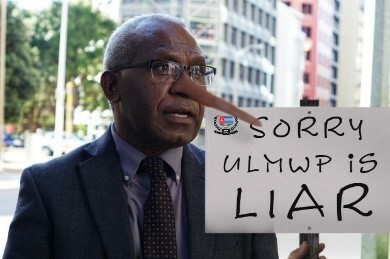 Reported from papuanews.id, the Free West Papua campaign conducted by secretary general ULMWP Okto Motte, at the National Lawyers' Office of Guild Chapter NYC, New York, has failed to convince the participants present on issues of West Papua referendum. At the meeting, Okto Motte tried to convince the participants that the process of joining Papua into Indonesia was illegal. Okto also added that currently there has been genocide against indigenous Papuans conducted by Indonesia, whereas the opposite is true, where the Indonesian government is continuously trying to prosper the people of Papua by doing infrastructure, economic, social and cultural development. The issues of genocide, violence, and discrimination presented by Okto Motte were dismissed directly by the opinion of one of the participants representing the International Peace Institute (IPI) named Roy Taborat. He expressed his opinion that, the legal status of Papua as part of Indonesia is final and binding based on the principle of "Uti Posidetis Iuris". The unification process of Papua in Indonesia is very different from the case of East Timor, so there is no reason for ULMWP to demand a referendum. The genocide action that ULMWP has been accusing is very difficult to prove. In fact, according to Roy, the world recognizes that Indonesia is an active country fighting for human rights in the international community. In addition, the struggle of Indonesian heroes in liberating Indonesia, including Papua as part of it, as well as in Military Agencies I and II has proved that Indonesia is fighting for its sovereignty as well as the people in Papua, to this day, the continuous development in eastern Indonesia also become one of the attention in welfare of people in Papua. Furthermore, having failed to address the issues and lies of the forum, and failed to respond to Roy Taborat, the International Peace Institute (IPI) representative at the forum, the moderator immediately closed the meeting.